Prentice Hall, 2003, ISBN 0-13-034074-X. For examination copies, contact Tim Galligan. 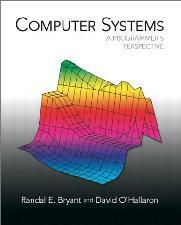 Students should be introduced to computer systems from the perspective of a programmer, rather from the more traditional perspective of a system implementer. What does this mean? Students should get a view of the complete system, comprising the hardware, operating system, compiler, and network. Students learn best by developing and evaluating real programs that run on real machines. We cover data representations, machine level representations of C programs, processor architecture, program optimizations, the memory hierarchy, linking, exceptional control flow (exceptions, interrupts, processes, and Unix signals), performance measurement, virtual memory and memory management, system-level I/O, basic network programming, and basic concurrent programming. These concepts are supported by series of fun and hands-on lab assignments. See the manuscript Preface for more details. The Student Site contains additional material for the students. The Instructor Site contains a complete turnkey solution for teaching the course.